A dozen Virginia Institute of Marine Science graduate students celebrated a triple milestone this weekend when they not only took part in William & Mary’s commencement ceremony, but did so during VIMS’ 75th Anniversary year, and in a group that brings to more than 1,000 the number of degrees awarded to students at the Institute. The first Master’s degree awarded to a student studying marine science at VIMS was in 1943 and the first doctoral degrees were awarded in 1968. This semester’s commencement group—with 6 Master’s and 6 Ph.D. participants—brings the total number of degrees earned by students at VIMS to 1,002—comprising 624 Master’s theses and 378 doctoral dissertations. Schaffner says this year’s graduates “are already moving into jobs that will allow them to contribute to healthier ecosystems, productive fisheries, safer coastal communities, and more effective STEM education. I’ve enjoyed interacting with them during their time as students and now look forward to watching as their careers develop." Dr. Allison Colden received her doctorate while on a short break from her work on the staff of U.S. Congressman Mike Thompson (CA 5th District), where she is serving as a Knauss Fellow. At VIMS, Colden studied how the physical aspects of restored oyster reefs enhance the success of oyster populations and the provision of habitat for other estuarine organisms. Fellow Ph.D. recipient Dr. Alison Deary’s dissertation research focused on the development of feeding structures in drum, croaker, spot, and other members of the sciaenid family—many of which are recreationally important fishes in Chesapeake Bay. Deary’s interdisciplinary project synthesized aspects of fish development, physiology, anatomy, ecology, and evolution, helping advance both basic scientific knowledge and fisheries management. Emily Egginton Skeehan received her Master’s degree, and like Colden is serving as a Knauss Fellow in Washington, D.C., as the Strategic Planning and External Affairs Coordinator for NOAA. For her graduate research, Skeehan modeled the sustainability of proposed restoration activities in the Lynnhaven River ecosystem under predicted scenarios of climate warming and sea-level rise. Fellow Master’s recipient Carissa Gervasi’s thesis involved analyzing and updating current knowledge of the reproductive biology of striped bass in tributaries of Chesapeake Bay. One of her primary research questions was whether mycobacteriosis disease hinders the fertility of female striped bass, with clear implications for the future health of the Bay’s striped bass stock. Michael Kuschner also received his Master’s degree, focusing on ecosystem modeling in Cherrystone Creek, a focal point in Virginia’s hard clam aquaculture industry. Kuschner assessed ecosystem health by running simulations with differing land-use scenarios and clam populations. With his thesis behind him, Kuschner has taken a hiatus from research to resume his sailing career by training for the 2016 Rio Olympics. 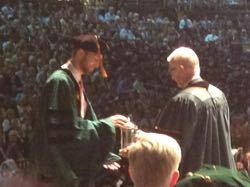 Dr. Jonathan Lefcheck, a Ph.D. graduate, was honored during commencement with the 2015 Thatcher Prize for Excellence in Graduate and Professional Study—the highest award for a graduate or professional student at W&M. Lefcheck’s doctoral research combined experiments and field observations to explore how biodiversity supports ecosystem function. Lefcheck will continue at VIMS as a post-doctoral research associate. 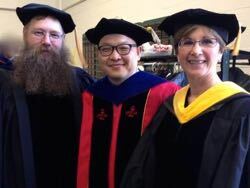 Despite a heavy teaching load as an Associate Professor of Biology at Thomas Nelson Community College, Dr. Jennifer Martin completed her doctoral research and processed at commencement. She studied the taxonomy, distribution, and phylogeny of the family Trachipteridae—the dealfishes and their relatives. These deep-sea fishes are threatened as by-catch in fisheries around the world. Dr. Ryan Schloesser, another Ph.D. recipient, focused his research on young-of-the-year fishes in Chesapeake Bay, specifically how the health of individuals varies in time and space, and how the health of individual fish affects the survival of juveniles into the adult population. Erika Schmitt—whose graduate research focused on relative predation rates on Bay scallops relating to spring and fall spawns—received her Master’s. Fellow graduate Dr. Jessica Lisa—who examined the linkage between the structure and function of microbial communities responsible for nutrient processes in the New River Estuary and Cape Fear River Estuary in North Carolina—received her doctorate. Like Lefcheck, Lisa will be staying on as a post-doctoral research associate at VIMS. Though they won’t officially graduate until August, VIMS graduate students Katie May Laumann and Nicole Marshall also participated in Saturday’s ceremony along with their classmates and peers. Laumann’s graduate research focused on the anatomy, systematics, and biogeography of sturgeons, while Marshall’s research interests include sediment transport, sedimentology, coastal oceanography, and paleoceanography. Laumann will receive her doctorate while Marshall will receive her Master’s.